fix some issues and all items can be enchanted! same as v 1.2 but all colors (black, white, red and chainmail) are craftable! Now an Retexture is available! Many many thanks to clethcleth for this amazing Retexture!!! - Now you can combine the black and the red Northgirl Armor! - The leo look by clethcleth is available! The Retexture by Gamwich is available! Thank you Gamwich for another great Retexture!!! The Retexture by trebtreb is available! Thank you trebtreb for this really nice white Retexture!!! I orginally wanted to keep this mod for myself, but i think I should share it with you! This mod is my own version of different mods. you find it under the Hide section, amulet under Jewelry section. All meshes are standalone, cause i like to combine different things! 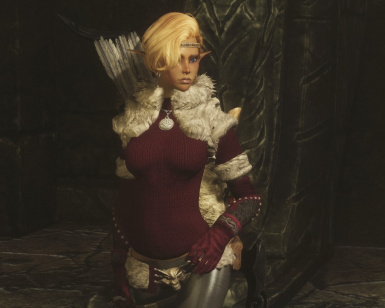 The mod includes a knit jumper, fur jacket, trousers, boots, gloves, belt and amulet. Thank you Seren4XX ... I like it :D and many thanks to SaioTV for another great video!